On May 31, a delegation led by Mr. Chansy Phosikham, member of the Political Bureau of the Central Committee of the Lao People’s Revolutionary Party (LPRP), Secretary of Secretariat of the LPRP Central Committee and Head of the Central Committee’s Organization Department visited Chinese Academy of Agricultural Sciences (CAAS) , with accompany of Mr. Wang Wentian, Chinese Ambassador to Laos. Mr. Chen Mengshan, Secretary of Leading Party Group of CAAS hosted the visit. Mr. Chen Mengshan delivered warm welcome to Mr. Chansy Phosikham and his delegation. 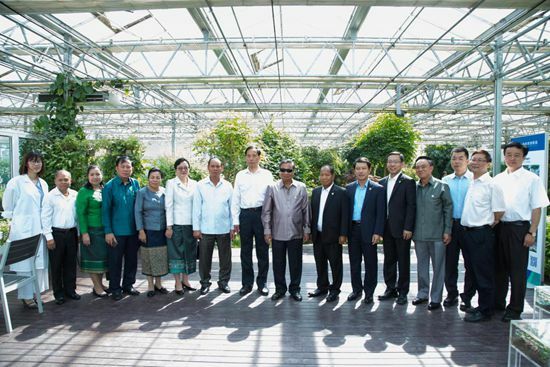 When touring the National Agricultural Science and Technology Innovation Park, the delegation expressed intense interest in urban agricultural design, vertical farming and automatic controlled hydroponic farming technology. Mr. Chen Mengshan briefed Mr. Chansy Phosikham on his meeting with Mr. Lien Thikeo, Lao Minister of Agriculture and Forestry during his visit to Laos in 2016, in which both sides reached consensus on strengthening collaboration in the fields of rice breeding, combating bamboo locusts and the utilization of methane technology. Chinese and Lao researchers have made follow-up efforts in the cooperation with noticeable progress. Mr. Chansy Phosikham spoke highly of CAAS’ innovative technologies, hoping to learn from the successful experience and enhancing collaboration in agricultural technology. Mr. Gao Shijun, Director of the General Office, Dr. Hao Weiping, Deputy Director General of the Department of International Cooperation, and Mr. Hao Zhiqiang, Secretary of the Party Committee of the Institute of Environment and Sustainable Development in Agriculture were on the host list.